The letter P inspired forty phenomenal Indian flavors! Let's start with a array of P vegetables: the first is colorful and chubby , followed by nine veggies that all happen to be painted in myriad shades of green, and the last is a popular starchy root! First up, the Pepper: an potent word in the culinary world. It can mean anything from peppercorns that constitute the most basic seasoning, to the dizzying array of chili peppers that provide the kick and the zing in a multitude of cuisines, to the chubby vibrant bell peppers that are mild and tasty enough to be savored as vegetables. TC of The Cooker takes advantage of the hollow insides of the colorful peppers. She stuffs pepper halves with a savory mixture of vegetables, potatoes and spices, then bakes them to perfection. The resulting Stuffed Peppers are versatile delights that can be enjoyed as an appetizer or a main dish. The next vegetable is the Pea, the pint-sized green gems packed in their pod. Peas are such a versatile vegetable, used in dozens of different ways in Indian cuisine. Today, we get to eat them in the tastiest way possible, in two delicious appetizers, both P words! Dhana of Fresh Kitchen chooses to make pattice. Now, we all know what a "patty" is: usually a savory flattened cake of some kind. But in India, the unique term "pattice" refers to a turnover consisting of puff pastry enclosing a tasty filling of some sort. In bakeries all over India, across small towns and megacities, patties (pattices?) will be made and sold like hot cakes every single day (confused metaphor there, but you get the picture). Dhana now teaches us to make these delights in our own home: she makes a savory filling of peas, corn and spinach, then drapes some ready-made biscuit dough over it to makes this appetizing Peas and Corn Pattice. Sharmi of Neivedyam chooses to make potlis. A "potli" is a cute little purse or moneybag that can be closed with a drawstring. Sharmi's adorable edible potlis are made of home-made pie dough, and contain a treasure of spicy potato and peas. Go steal a look at these artistic Potlis with Potatoes and Peas. Coming up next is the long, tapering, placid Plantain, the family that includes bananas. Some varieties of the starchy plantain are especially wonderful for cooking. A Cook of Live To Cook cooks them in a very interesting Tamil style called Plantain Paniyaram, or puffy, golden brown, savory pancake balls. The first course is a steaming hot cup of soup: Ramya of Mane Adige cooks spinach with a flavorful combination of onion, ginger, cinnamon and cloves, then adds some tomatoes and corn to make this nutritious and utterly slurpable Palak Corn Soup. Next, a popular appetizer: Swapna of Swad makes Palak Pakoras that take minutes to make and mere seconds to disappear, blending spinach with chickpea batter and spices, then frying spoonfuls of the batter until golden brown. Tee of Bhaatukli makes a cool recipe for summer: tasty spinach dumplings in a yogurt sauce. Her Paalak Dahiwade are a smart way to sneak in vegetables into a beloved snack. Then, Rinku of Cooking in Westchester illustrates that spinach can be teamed with other foods to make quick non-fussy everyday meals. She combines bright green spinach with deep red kidney beans to make a pot of colorful Palak Rajma. Following close is another green vegetable, with tightly packed pale green leaves: Pattagobhi, Hindi for cabbage. "patta" means leaves, and "gobhi" means cabbage, the close relation, the cauliflower is called the "phulgobhi" where "phul" means flower. Musical of Musical's Kitchen makes a complete Home-style meal: she cooks the Pattagobhi together with Purple Potatoes, and serves this with a dal made using Peas...comfort food at its best! The next vegetable is beloved in India- a cute petite squash called Parwal in Hindi and ivy gourd or pointed gourd in English. Richa of As Dear As Salt eats a delicious dish featuring parwal at a restaurant, then comes home and recreates us in her own kitchen, then shares the recipe for Parwal and Kale Chane. Then comes a huge prickly tropical fruit: the jackfruit or Panasa. Dee of Ammalu's Kitchen makes a festive dish with canned jackfruit, a stir-fry with an aromatic tempering of mustard seeds, Panasa Pottu Koora. Sheela of Delectable Victuals cooks this vegetable by the method of Pan-frying, a useful cooking method for rustling up quick and tasty vegetable dishes. Her Pan-fried Pavakkai is a wonderful side dish, and the post has many useful tips for cooking with this vegetable. 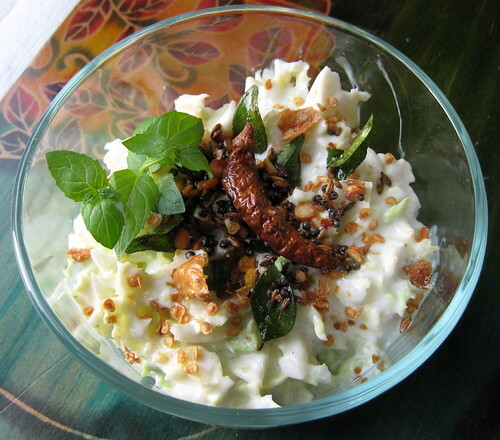 Sigma of Live To Eat turns the bitter gourd into a Pachadi, or yogurt-based salad. In her step-by-step recipe, one can see how minced bitter gourd is fried until golden, then seasoned with tempering, a spicy coconut paste and yogurt to make a cool Pavakka Pachadi with complementary bitter, tangy and spicy flavors. The next veggie is a poised and pretty, long strands of green blending into white...Piyajkoli, the poetic Bengal word for scallions/ green onions/ spring onions. Sandeepa of Bong Mom's Cookbook makes a quick and delicious stir-fry with scallions- her Piyajkolir Tarkari has a burst of flavors from scallions, potatoes and shrimp, with the aroma of nigella seeds to spice it up. Then comes a summer favorite; mint or Pudina. With its pleasant sweet flavor and distinctive cool aftertaste, mint adds a special something to many Indian dishes. Madhuli of My Foodcourt created a recipe of her very own: stir-frying tofu in a fragrant mint paste, with a tangy touch of chaat masala to make this Pudina Tofu Stir-fry. Well, this experiment looks like a complete success to me! The last vegetable is #1 when when it comes to popularity, none other than the pre-eminent Potato! Swapna of Swad gives the potato a glowing representation by cooking it with eggs in a famous Parsi brunch dish, Papeta-Pur-Eedu. Now come four P foods that are popular, prominent and precious in the world of Indian cuisine! First comes Paneer: the milky, mild Indian cheese. Un-aged and rennet-free, paneer is easy to make at home and versatile in its uses. We have five paneer dishes here, all crowd-pleasers! Now that barbecue season is upon us, it is time to make some juicy paneer kebabs. Paneer is a non-melting cheese; upon grilling, it becomes tender and flavorful and eagerly absorbs the flavors of the marinade. Sreelu of Sreelu's Tasty Travels takes this Indian grilled staple to the next level: she skewers chunks of paneer together with a whole host of P goodies...Pineapple, Pepper, Pudina (Hindi for mint), Pyaaz (Hindi for onion). The combination of the spicy paneer with the smoky sweetness of the vegetables and the aroma of the herbs results in this picture-perfect platter of Paneer Kebabs! Pooja of Khaana Pina talks about the nostalgia of street food in the city of Pune. She then recreates one of her favorite street foods, Paneer Kathi Kabab, with a detailed recipe so we can all try it too! Also, check her blog for many interesting posts about the "rainbow colors of food". Aarti of Aarti's Corner was inspired by the Vietnamese and Indonesian pastries called lumpia. She makes a spicy mixture of paneer and cabbage, then stuffs it into a freshly made dough and rolls it into a cigar shape. The roll is fried to perfection to make these innovative and tempting Paneer Lumpia. Mahek of Love 4 Cooking makes a classic tomato-based curry, Paneer Jhalfrezi. The classic trio of onion-pepper-tomato combines with classic North Indian spices and soft paneer to yield lip-smacking results! Swapna of Swad tasted paneer biryani made by a friend and loved it so much that she wheedled the recipe out of him! She now shares the recipe for this popular Paneer Biryani with all of us, with neat step-by-step instructions, complete with pictures. Neelam of Recipe Factory shares an easy recipe to make the restaurant favorite, Palak Paneer, in your very own kitchen. Lakshmi of Veggie Cuisine shares a fellow bloggers' tried-and-tested recipe for another delicious version of Palak Paneer. Second comes Pulao, or pilaf or pulav...all terms for flavored rice dishes. A pulao offers an open-ended opportunity to a cook- a blank canvas to paint with spices and veggies, nuts and dried fruits as one likes: rice+ innovation= pulao! Vani of Mysoorean shares a recipe for a Plain Pulao which does not sound that plain to me at all- it is cooked in a rich mixture of water and milk and is redolent with whole spices and herbs. To make a complete feast out of it, Vani serves the pulao with some tasty egg curry and crisp Potato wedges. Ramya of Sena's Rasoi makes the ever-popular Peas Pulav, with a recipe that is elegantly simple- a few ingredients come together in an uncomplicated way to make a tasty meal in minutes. Third comes Papad: thin, dried, brittle discs that can be roasted or fried into crunchy treats. The papad or papadum can make every meal special (pulao and papad happens to be a particularly well-loved combination). One wildly popular brand of papad, Lijjat papad, also happens to be a very interesting story of women's empowerment. Swapna of Swad is inspired by her aunt's recipe and shares a way to make a crunchy tea-time snack, Papad Pohe. Reena of Spices of Kerala makes plain whole-wheat puris, then goes on to serve them with a spicy and aromatic vegetable made with potato and fenugreek (a match made in heaven! ), resulting in this appetizing and festive meal of Poori with Aloo Methi. Manasi of A Cook At Heart kneads spinach and wheat flour together, then rolls out the dough into little Palak Puris. Tasty, puffy and crisp, these puris are the stuff of school picnic memories for many of us! Asha of Aroma/Foodie's Hope minces up some aromatic mint leaves and kneads them into a spicy dough to make these lovely fried Pudina Puris. Served with some tasty tomato chutney, these quick puris sound like the perfect tea-time snack! Coming to the regional specialties, first up is Puttu, a cylindrical steamed rice cake. Reena of Spices of Kerala explains that, "Puttu and Kadala curry (Black chana curry) is Kerala’s very own breakfast". As they say, try, try and you will succeed, and here, Reena shares her puttu success story with a tried-and-tested recipe for Puttu and Chana Curry. Then comes Pithla, a rustic curry made with chickpea flour. Aarti of Aarti's Corner makes the classic combination of Pithla Bhakri and adds that she served "pithla with bhakris, rice, buttermilk and spring onion…. A perfect marathi meal, ideal for a weekend...". for a simple meal that is rich in taste. Anita of A Mad Tea Party assures us that, "Preparing alu wadi (wadis made with taro leaves) is somewhat labour-intensive, but not hard". She proceeds to write a beautifully detailed account of the preparation of the delicate Patode, complete with pictures that will make you want to run into the kitchen and make them right away. Roopa of My Chow-Chow Bhath tells us that, "Back in my hometown, we grow these leaves in our backyard is very handy to use in case we are short of veges". I remember the taro plant in my parents' backyard too! Roopa gives a delicious step-by-step recipe for Patrode/Patra with handy tips for serving the sliced rolls, and for freezing them. Prema of My Cookbook explains that "Pesarattu is a key item in Andhra cuisine" and goes on to share a detailed recipe for making Pesarattu with Upma that is thin and crispy, filled with chopped onions and chilies. Sukanya of Hot 'N Sweet Bowl talks about her love for this dosa..."Once my family and I went to Trupati and we found this pesarattu in almost all the restaurants.. From that time Pesarattu became my families favorite dish." She provides recipes for the whole menu: Pesarattu with Uppma, and a flavorful ginger chutney. Suma of Veggie Platter makes three traditional versions of the Patoli to demonstrate the versatility of this method, pointing out that it is "An easier, smarter way to feed the family, the nutritious stuff". Bee and Jai of Jugalbandi show us a way to get creative with the basic method and adapt it to all kinds of vegetables; they take advantage of seasonal produce to make some Patoli with Asparagus. To make everyday cooking more efficient, they share a useful tip: "Make extra batches of the lentil paste and freeze for later use". The next P food may not be distinctly Indian, but it sure has an international fan following: Pasta! Deepa of Recipes 'N More raids her pantry and whips up a simple and tasty lunch of Pasta with onions, peppers and tomato sauce. As we start winding down this round-up, it is time for a bite of something sweet. One stove-top pudding that is a popular sweet in its many avatars (can be made with wheat/ rice/ noodles) is the Payasam, the South Indian counterpart of the Kheer. Sushma of Sunkiran's Recipe Source gives us a taste of some rich and creamy Payasam made with semolina, with a delicate touch of saffron. The final dish is a rather mysterious one: Pidza! Are you perplexed and perturbed? To solve the puzzle, go visit Coffee of The Spice Cafe and find out what Pidza is all about. Two hints: (1) it is the international food of mystery, and (2) it is delicious! We are on a "accompaniments" roll...close on the heels of the chutney, comes the salad! Unlike most American and European meals, where the salad is usually a separate course, in the Indian thali, the salad is part of the array of delicious "courses" all beautifully arranged on one large plate. It forms a crunchy, cool counterpoint to the rest of the meal. During the sultry days of summer, a big bowl of raita is a truly refreshing treat. Indian salads come in many different forms. In a departure from olive oil and mayonnaise, Indian salads are most often dressed with yogurt or lemon juice. Other additions are often region-specific. The raita is the term often used for salads made in North Indian style, usually seasoned with cumin, mint and yogurt. The kachumbar often has a mixture of onions, tomatoes and cucumbers with a fiery hint of chillies. The Maharashtrian koshimbir gets a nutty sprinkling of crushed roasted peanuts. The South Indian pachadi sparkles with an aromatic tempering of curry leaves and mustard seeds with the creamy backdrop of yogurt. Indian salads can range from the really simple to the fairly complicated. Many times, the salad may simply consist of thin slices of beets, cucumbers, carrots, tomatoes and onions, all decoratively arranged on a plate and sprinkled with salt and lemon juice. Other salads may involve complex pastes of coconut and an array of spices. 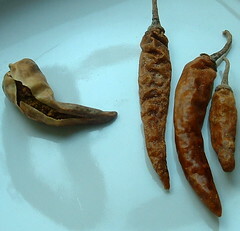 These are hot chillies that are stuffed with a mixture of yogurt, spices and salt, then dried in the sun. They can be stored, and to use them, one simply pops them in some hot oil for a couple of seconds. That is enough to get them beautifully crisp. Crushed fried "dahi chillies" really takes pachadis to the next level by making the flavor pop! If you plan on using these, add less salt to the salad, because dahi chillies are generally quite salty. The dahi chillies I used were store-bought, but you can certainly make them at home in dry, sunny weather. 1. Place all the ingredients "to be mixed" in a large bowl, and stir gently to mix them together. 2. Heat the oil in a small skillet. Fry the dahi mirchis (stuffed chillies) for a few seconds, then remove from oil and set aside. 3. To the remaining oil, add all the ingredients in the "tempering" list and stir until the mustard seeds pop and the dals turn golden. Pour the tempering into the bowl over the cabbage and yogurt. 4. To the bowl, add the cilantro and crushed fried dahi mirchis. Mix well. Top with sprigs of mint and serve. This salad goes well as part of any South Indian meal. I love eating it with khichdi too. I also mix culinary traditions and eat it with North Indian parathas! hai nupur Its really a nice a to z food journey.I am inspired of your blog and it induced me to create a new blog www.addflavour.blogspot.com .This week I saw the letter P.Immediately in my mind n number of list striked out.can i join and share my thoughts? It's so p-inspiring to see all the p-creative entries. This is a really great project, Nupur, what a showcase of creativity both food-wise and linguistically. you didn't cook the cabbage! you're my hero. cabbage is not meant to be cooked. that's my theory, anyway. Lovely Pachadi and round up, Nupur. Haven't yet had my b'fast and am going crazy looking at all the yummy dishes. One shouldn't read A-Z round up without eating something ;) or one can just get up, and dish out something fabulous from the round up for b'fast, lunch and dinner :-D i'll subscribe to the latter theory :)). Don't listen to naughty Bee, she's not friends with cabbage ;). 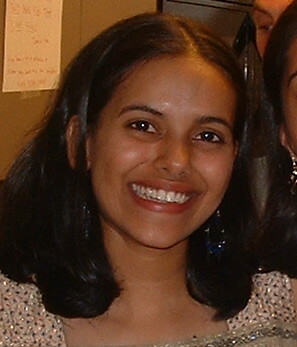 nupur, i am glad p inspired such tempting recipes and your round up is very interesting to read. very thoughtful as always. I must congratulate you for the success of this event. I wait for your round-up every sunday morning as if waiting for my sunday newspaper. And the entries are growing interesting by the alphabet. I have to visit all these blogs. Cheers. Andhra style pachadi (with a stress on 'ch' sound) tend to be spicier and we love them. Wondering what are going to show up on 'Q' parade. Looove uncooked/partially cooked cabbage. I haven't seen this pachadi being served in my family.. But sure sounds delicious..
Reena, can't wait to see the Q entry!! Suma, the andhra-style pachidi sounds awesome!! I should look around for some recipes on blogs. Suganya, I doubt this is a legitimate traditional recipe :) Just something I made in the "pachadi" style...but it tastes good! 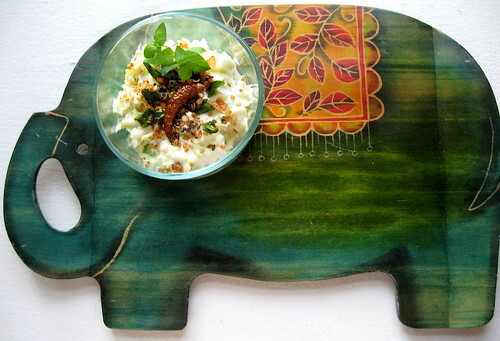 Asha, I am addicted to dahi mirchi :) glad you like it. Cabbage pachadi is new to me...it looks really delicious...I gotto try so many wonderful dishes from the roundup :-)...beautiful write up Nupur..
dahi-mirchis are my favourites too. The pachadi is looks so refreshing. We just consumed the upcoming 'Q' dish. It was good ! Can't wait to post it. What a lovely round-up, N! You've taken time to write about each entry and you write so well! Can't believe you've been doing this every week now. Great job!! Excellent round up, love the way you add your word to each entry and make it special, I bet that takes a lot of effort. Truley appreciate your effort and enthu. the Pachadi looks out of this world!! simply great. the pic of that creamy pachadi had made my jawdrop. thanks for the lovely roundup. Hey Nupur, guess what? My Sri Lankan friend in the US sent me some of those exact chillies that you have in the photo! Yogurt spices etc! I am so excited to actually see it here. Silly I know. I have mine stored in a jar in my pantry. Dhana...and I loved that you participated! :) Let me know if you try the pachadi! Arts, thanks so much...it is a pleasure writing these round-ups! Vani, my mouth was watering as I was writing about your pulao and phodis! Sreelu, How about some "Q for quick" vegetable dish? I'm sure you have lots of ideas for quick recipes! See the Q announcement at the beginning of the "O for onion chutney" post. Cynthia, have you had a chance to try the chillies yet? They are sooo good. I haev mine in a jar in the pantry too, and they are disappearing fast!